The ClearPoint team is phenomenal. I know that I can call or email anytime, with any question, and I will always receive excellent customer service and a lesson on the issue. Each time I work with the team, I walk away with more knowledge about the functionality of the product. The "I didn't know ClearPoint could do that" Webinars are a perfect way to keep up on the latest, and are available to users anytime. I dislike the fact that we can't "hide" rows in the data table that we are not using. I have a hard time moving images around in a pod to align like I want them. ClearPoint is an excellent tool for performance and project management. The team provides outstanding customer service and the product continues to improve based on customer's requirements. Not only does ClearPoint work to improve the functionality of the product, they are building a community of users to share best practices in order to elevate overall performance levels, service delivery, and continuous improvement. We are tracking AIPs (Action Initiative Plans) that the Leadership team created during their StratOp (Strategic Operations) project. Leadership Team works together bi-weekly to update AIPs in ClearPoint. The Leadership Academy is a new course within our Arvada University program. There are two teams of individuals who are tackling big organization-wide projects, and they knew right away that tracking these projects in ClearPoint would assist in their success. We created a Leadership Academy Scorecard and added the two projects which the team can access easily in an Alignment Matrix. One of my main tasks is to track our Process Improvement projects in ClearPoint. We have a Process Improvement Team called the Ninjas, and we've created a Ninja Scorecard to include a list of all projects, page detail layouts to reflect our systematic approach, and a performance measure to track overall cost savings by work system. I love being able to share the PI project with the entire team, owners, supervisors, and Leadership Team to tell the story of all of the hard work the team is doing to create meaningful change. It's as easy as emailing the page, creating a PDF, a Briefing Book, or as simple as providing the team with the ID#. The City Council Strategic Plan provides vision for our work. The plan outlines five Priority Areas. Each Priority Area includes specific Strategic Results that define different focus areas. Strategic Results have Milestones that support the Strategic Plan. Key Performance Indicators, which are SMART goals, live within the City's work systems and measure performance outcomes to ensure successful completion of Strategic Results. Living at the Program level, Performance Measures complete the golden thread by aligning the work City employees do on a daily basis to Key Performance Indicators and Strategic Results. ClearPoint's customer service is outstanding. We've had ClearPoint for about a year now and there's nothing we don't like. If there's something we can't do, ClearPoint will make it happen. ClearPoint is a wonderful tool for performance management. And their customer service is outstanding. We were searching for a web-based performance management tool for our local government. ClearPoint was the perfect choice and has not disappointed. The wide array of resources that are instantly available, plus exceptional customer service/tech support. It is sometimes necessary to go to several different screens to complete an update. A good quality product with excellent customer/tech support. We are actively tracking key performance metrics and making the data available to our customers so they can know at a glimpse what we are doing and how we are doing it. Clearpoint is simple to use and yet has great capabilities. We have been able to easily train a number of non-technical staff to setup and maintain their information in Clearpoint. The ability to track the progress of your measures, align them in a variety of ways, and report via operational dashboards, strategic scorecards, etc. without the need to duplicate any data to do so. Automated loading of data from a variety of sources whether excel files or a SQL compliant ODBC data source makes maintenance and upkeep of the system a breeze once everything is set up. The ability to report the data out directly to your website simplifies transparency initiatives. 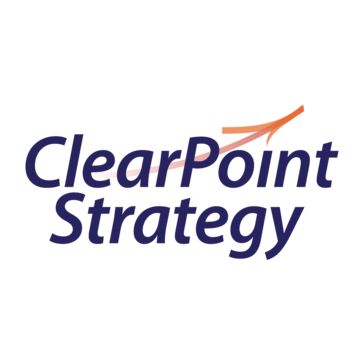 The Clearpoint support team is one of the best in any industry. They are extremely knowledgeable and customer service focused. They always provide fast response and are eager to help. Does most everything I ask of it. I do wish I could report different reporting frequencies in the same heatmap. Clearpoint actively listens to customer feedback and looks at industry trends to continually improve the product. This is a tool that will keep growing and stay ahead of you and your needs. Unquestionably the best part of ClearPoint are the people that work they and the way they have fostered a culture that is centered around providing an exceptional customer experience. The amount of help you receive from the ClearPoint for any minor issue is incredible. They will bend over backwards for you. The support feature of this organization is top quality. Not only do they have the live support feature that can be used to chat with the ClearPoint team, they also have a robust support site with enough information that a first time user could figure out most everything by self educating. At times, the software itself can be slow or have bugs- but they always work rapidly to patch and fix any issues that the end user might have. They also go above and beyond to make sure that you are inconvenienced in the most minor way possible if there is ever an issue. For example, if there is a bug that prevents you from doing something on your end, they take care of it on their end for you. They also continually roll out upgrades to the system. This is an excellent product for an organization that is looking to enhance their organizational understanding of data and performance measurement, and how to align those items with strategy. For an organization that wants to take a major step in measuring their performance, this is a great tool that wont also down you like some of the other more intensive solutions. After having dabbled with more of the elements that ClearPoint offers (project management etc. ), it is clear that this can be a tool that does it all for an organization looking to track performance and strategy completion. We use ClearPoint as a platform for our citywide performance scorecard program. This system has allowed us to develop a consistent approach to performance measurement, and has allowed our departments to measure what is most important to them in a way that is well organized and strategically aligned. ClearPoint gets our data out of the spreadsheets and into a space that helps us better facilitate data driven decision making.